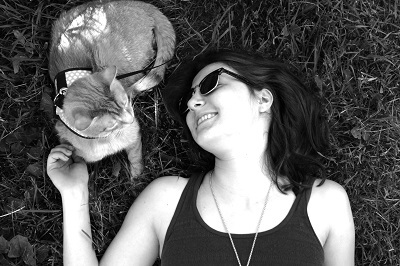 Sheba claims that it’s “What Cats Want™”, but is it a good choice for your cat? Find out in our unbiased Sheba cat food review. 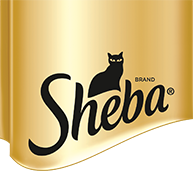 We’ve taken a close look at Sheba and graded it according to the We’re All About Cats standard, evaluating the brand on species-appropriateness, ingredient quality, product variety, price, customer experience, and recall history. Here’s how it rates in each of these key areas. In total, we give Sheba cat food a 42 out of 60 rating or a B grade. Sheba is a cat food brand created and manufactured by Mars, Inc., the world’s highest-earning pet food company. In addition to Sheba, Mars owns and manufactures over 40 pet brands, including Whiskas, Royal Canin, Iams, and Crave. Most Sheba cat food is manufactured in the United States. Their Signature Broths line is made in Thailand and Sheba Meaty Tender Sticks treats are made in Austria. According to a Sheba brand representative, most, but not all, of their ingredients are sourced from North America. Sheba doesn’t specify exactly where all of their ingredients are sourced. Like all Mars brands and subsidiaries, Sheba participates in Mars’ Responsible Sourcing program and holds suppliers to the Mars Supplier Code of Conduct. Has Sheba cat food been recalled? Sheba cat food has never been recalled, but its parent company has announced numerous recalls of other Mars cat food brands. What kinds of cat food does Sheba offer? Sheba offers a slim selection of wet cat food and treats. Thanks to the brand’s focus on wet food, Sheba products are meat-heavy with minimal starches, plant protein, and other plant ingredients. Sheba foods contain a combination of named meats and vague items like “fish” and “meat by-products”. Some Sheba recipes contain “added color”, a vague title referring to a variety of FDA-approved color additives, including synthetic dyes. All Perfect Portions foods are packaged in plastic twin-pack trays, promising fresh entreés without any messy leftovers. Choose from portions of premium paté, garden medleys, or cuts in gravy. Sheba Signature Broths feature meat, fish, and vegetables set in creamy or clear broth. Recipes include Tuna, Shrimp, & Salmon in Creamy Broth and Oceanfish & Vegetable in Clear Broth. Sheba Meaty Tender Sticks are meat-based treats available in chicken, salmon, turkey, tuna, beef, and whitefish flavors. Whitefish appears to be the primary protein source in this wet cat food. This Perfect Portions food is a meat-based paté with no grains, plant protein, or starches. The food features whitefish as the first ingredient. Whitefish isn’t a species of fish—it’s a term used in fisheries to refer to a variety of species, including, cod, whiting, haddock, hake, pollock, and other bottom-feeding fish with fins. While fish is delicious, it’s not the best protein source for cats. Fish tends to have high concentrations of heavy metals and other contaminants. Fish-based foods like this Sheba recipe are best reserved for occasional feeding. In addition to whitefish, the recipe includes several non-fish meat ingredients. It’s made with meat by-products, chicken liver, tuna, chicken, and poultry by-products. The paté contains guar gum as a binder. While it’s not a natural part of the feline diet, guar gum is generally considered safe. The additive “natural flavor” appears at the end of the ingredient list. This additive is made from hydrolyzed animal tissue and is a concentrated source of flavor. The food contains “added color”, a vague title for any variety of natural or synthetic color additives. Overall, this meat-based food is high in protein with moderate levels of fat and low carbohydrate content. Each 1.3 ounce tray contains 45 calories or about 34.6 calories per ounce. Beef appears to be the primary protein source in this wet cat food. This Perfect Portions paté is made from beef in meat broth. In addition to beef, the food contains a mix of other named meats and vaguely-named by-products. It contains meat by-products, chicken liver, beef liver, chicken, and poultry by-products. A variety of nameless proteins may not be a concern for some, but is risky for cats with food sensitivities or allergies. Like all Sheba foods, this recipe contains “natural flavor”, an additive made from hydrolyzed animal tissue. It’s thickened with guar gum, which is not a species-appropriate ingredient, but appears to be safe for cats. The food contains “added color”, meaning that it’s made with unknown food dyes. In addition to the standard variety of synthetic vitamins and amino acids, the food is supplemented with fish oil as a carnivore-worthy source of omega-3s. Overall, this meat-rich food is high in protein with moderate fat and low carbohydrate content. There are 45 calories in each 1.3 ounce tray or about 34.6 calories per ounce. Beef, Meat Broth, Meat By-Products, Chicken Liver, Beef Liver, Chicken, Poultry By-Products, Minerals (Calcium Carbonate, Potassium Chloride, Magnesium Sulfate, Zinc Sulfate, Iron Sulfate, Manganese Sulfate, Potassium Iodide, Copper Sulfate), Natural Flavor, Guar Gum, Added Color, Sodium Tripolyphosphate, Fish Oil (Preserved with Mixed Tocopherols), Vitamins (Choline Chloride, Thiamine Mononitrate [Vitamin B1], Vitamin E Supplement, Pyridoxine Hydrochloride [Vitamin B6], Vitamin D3 Supplement, Folic Acid, Menadione Sodium Bisulfite Complex [Source of Vitamin K Activity]), Dl-Methionine, Salt, Taurine. For cats who prefer a chunky food, this Perfect Portions recipe is made with cuts of chicken in gravy. Chicken broth is the first ingredient, followed by chicken, chicken liver, poultry by-products, and meat by-products. It’s impossible to know which species and animal parts contribute to the by-product slurry, so if you’re concerned about digestibility or have a cat with food allergies or intolerances, such a vague ingredient list is a problem. Tapioca starch is used to thicken the gravy. The food contains “natural flavor”, which is made from hydrolyzed animal tissue and is a concentrated source of meaty flavor. The food contains “added color”, another vaguely-named ingredient that may refer to any FDA-approved dye. Fish oil is added as a species-appropriate source of omega-3 fatty acids. The food is stabilized with xanthan gum, a binding agent that’s generally considered safe, but may contain traces of allergenic residue. Overall, this is a high-protein food with moderate fat and low carbohydrate content. The food has 32 calories in each 1.3 oz serving or about 25 calories per ounce. Chicken Broth, Chicken, Chicken Liver, Poultry By-Products, Meat By-Products, Tapioca Starch, Natural Flavor, Minerals (Potassium Chloride, Magnesium Sulfate, Zinc Sulfate, Iron Sulfate, Manganese Sulfate, Potassium Iodide, Copper Sulfate), Sodium Tripolyphosphate, Added Color, Fish Oil (Preserved With Mixed Tocopherols), Salt, Xanthan Gum, Vitamins (Choline Chloride, Thiamine Mononitrate [Vitamin B1], Vitamin E Supplement, Pyridoxine Hydrochloride [Vitamin B6], Vitamin D3 Supplement, Folic Acid, Menadione Sodium Bisulfite Complex [Source Of Vitamin K Activity]), Taurine, Dl-Methionine. What do customers think of Sheba cat food? Most Sheba reviews are positive. Reviewers like that Sheba food is grain-free, meat-based, and affordable. Customers complain that the Purrfect Portions plastic trays are hard to open, messy, and too small. At least two Chewy reviewers said that they found bugs in their Sheba food, but it’s unclear who was at fault or how widespread the problem was. Let’s take a look at a few real customer reviews of popular Sheba cat foods. How much does Sheba cat food cost? Sheba is one of the most inexpensive brands on the market. 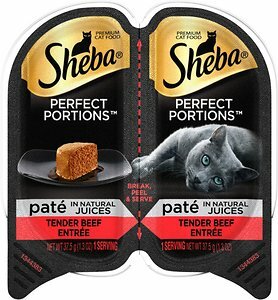 According to the brand’s recommendation of three servings of Sheba Perfect Portions per 5 lbs of body weight, it would cost about $1.56 per day to feed a 10-lb cat. Sheba’s Signature Broths are more expensive at about $0.71 per ounce, but they’re intended for supplemental feeding. Overall, is Sheba a good choice? Sheba cat food isn’t flawless, but it’s one of the best budget brands on the market. Sheba foods are free of artificial flavors and preservatives and, unlike some foods that rely exclusively on meat by-products, contain a mix of by-products and clearly-specified muscle meats. Compared to foods marketed as organic or natural, Sheba foods are affordable and easy to find in stores. Sheba receives primarily positive customer reviews and hasn’t ever been recalled, so it appears to be a reliable, safe brand. Where is Sheba cat food sold? Like most Mars cat food brands, Sheba is available in a variety of stores, ranging from pet specialty retailers to big box stores and groceries. Online, you can find it on Petco.com, Chewy, Amazon, and other online retailers that sell cat food. 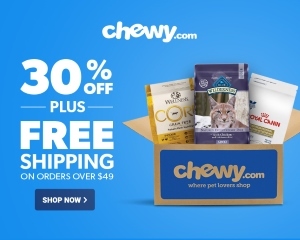 Click here to shop for Sheba cat food on Chewy.